Miray Ito appeared on Show 363 on November 17, 2018 in Storrs, Connecticut. She previously appeared on From the Top’s “Can’t Stop the Feeling” video. Miray Ito, 15, (violin) lives in Los Angeles, California where she is a junior at Oak Crest Academy. She studies violin with Robert Lipsett at Colburn Music Academy. 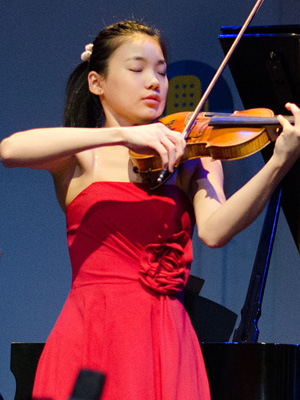 She was first prize at the 2014 Kocian International Violin Competition in the Czech Republic, hailed as “sovereign on stage,” and in the same year, made her Carnegie Hall debut. Miray performed in From the Top’s video cover of “Can’t Stop the Feeling” filmed in Aspen, Colorado in 2016. She was a prizewinner at the 17th Kloster Schöntal International Violin Competition in Germany and was a semi-finalist at the Menuhin International Violin Competition in Geneva in 2018. Miray was recently presented as the “2018 Young Artist of the Year,” an award granted by the Ruth Laredo Memorial Foundation, which gave her the opportunity to perform Spohr Violin Concerto No.8 with an orchestra. She also loves jazz hip-hop dance and photography.